I’ve never had much of a green thumb. I barely remember to water my house plants, and the container gardens I’ve had in the summer on our balcony have never thrived. 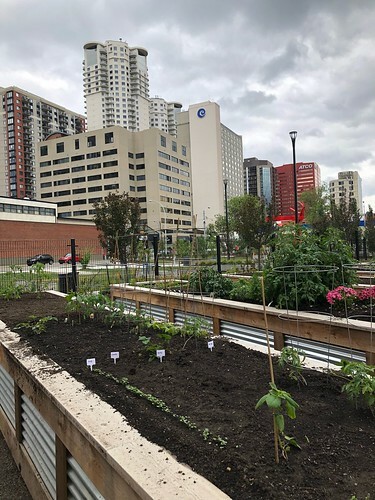 However, when the chance to sign up for a plot in our new Downtown Community Garden came up in the spring, Mack and I did so. 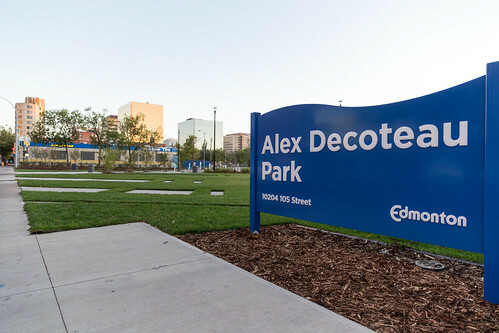 Located in Alex Decoteau Park that opened last fall at 102 Avenue and 105 Street, the garden is among several amenities that have been welcomed by residents, including a dog park, spray park, and green space. 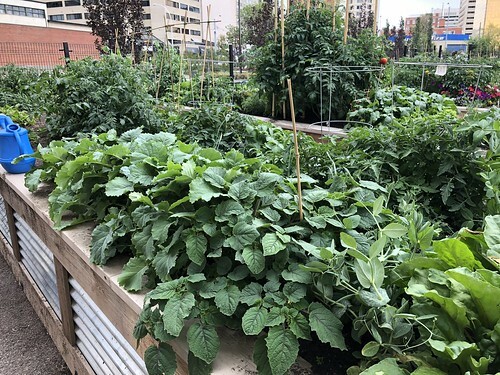 The desire for plots ended up being so high that the Downtown Edmonton Community League (which coordinates the garden) had to resort to a lottery system to pick from the applicants. When we found out we were selected in the first round, we had to decide whether to accept. Emily was the primary reason we had initially put our names forward. 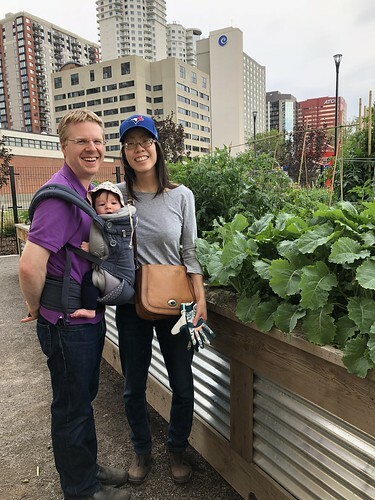 Knowing where our food comes from is important to us, and we were attracted to the idea that she could learn first hand how vegetables are grown. Still, with a new baby in the house, I thought the last thing I’d want to do this year is tend to a plot, especially since we are such novice gardeners. But giving up our chance this year might have meant being waitlisted for an unknown period, so we took the plunge. It helped too that the garden has a number of great features – most of the beds are raised, the garden itself is fenced in and locked (with a code shared only with gardeners), and there is water provided on site! We consulted with my Mum, gardener extraordinaire, for her recommendations on the most low maintenance vegetables to grow that wouldn’t require too much attention, and could stand being neglected now and then. She advised that we look to root vegetables like carrots and potatoes, garlic, and kale. Friends of ours who have more experience with gardening also snagged a plot, and started some plants from seed which they transplanted for us, adding tomatoes and ground cherries to our roster. Though we didn’t know if anything would grow, soon enough, promising green shoots appeared. The kale in particular blossomed with the constant exposure to the sun, and our garlic thrived. The tomatoes, which we thought couldn’t be saved after being ravaged by a wicked wind storm, bounced back. We learned though, a little too late, that we shouldn’t have planted the carrots quite so close to the kale, as the leaves quickly overshadowed the later-blooming carrot tops. Early on, I thought the last thing I’d want to do after putting Emily down for the night was go water some plants, but it’s become a calming, almost meditative way to end the day. And though we’ve only been able to harvest kale so far, it’s been pretty neat to be able to walk over and cut down some fresh vegetables for a quick salad or to add to our meal. So although we started off as reluctant gardeners this year, it’s safe to say we’re looking forward to learning from our missteps this year and being more thoughtful with our plant selections for next spring! 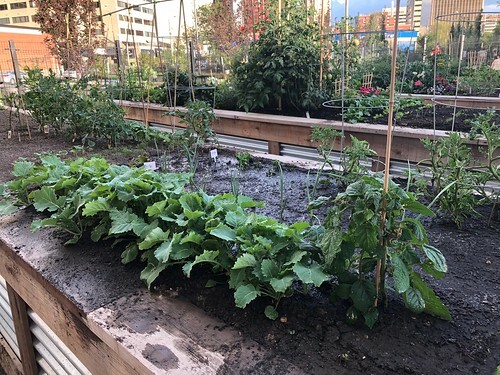 If you’re interested in learning more about the Alex Decoteau Garden, consider coming to the open house, scheduled for Saturday, July 21, 2018, from 10am-3pm. There will be kids garden crafts, and you can help yourself to some of the vegetables being grown in the community plot!